Description : Brandmyblog allows you to boost the readership of your blogs in a few minutes, by adding a small roll on your blogs sidebar. 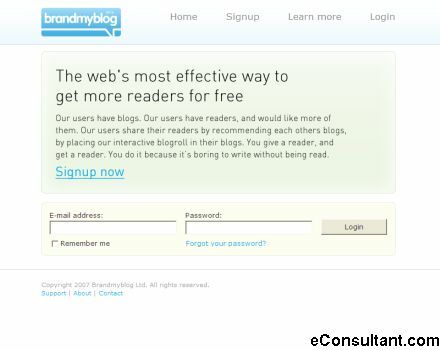 The idea is simple: Brandmyblog provide a free opportunity for you being a blogger to refer your readers to other blogs which publish something related to your own blog. In return, you get more interesting content on your blog, and you get your own posts exposed on thousands of other blogs similar to yours. Brandmyblog blogroll includes 3 blog-resumes which means that everytime a person load a page on your blog, you get your own blog-resume shown at 3 other blogs all around the world.